In Egypt, there is a gap in the production of summer forage crops estimated by about 90%. The objectives of this chapter were to quantify the effect of using unconventional practices to increase production of summer forage crops through: (i) cultivation of fahl clover as an early winter crop after maize, rice, or sorghum crops and before the following winter crop; (ii) implementing intercropping systems of cowpea with maize, sunflower, sorghum, and under fruit trees; (iii) To suggest crop rotations to be implemented in the new lands to help in filling this gap. The assessment was done using data of 2015 and with the projected data in 2030 in the five agro-climatic zones of Egypt. Using data published in 2015 on the cultivated area of the studied crops, the potential increase in the cultivated area of fahl clover and cowpea was calculated. The analysis indicated that the potential total cultivated area of both crops could be increased by 1467%, than its value in 2015. The potential cultivated area of these two crops was projected in 2030 using RCP6.0 climate change scenario resulted from MIROC5 model. The percentage of increase in water requirements of the selected crops was calculated, as well as the percentage of reduction in its cultivated area. The analysis indicated that the potential cultivated area of fahl clover and cowpea will be reduced in 2030 by 9%, compared to its counterpart value in 2015. The rotational effect on its cultivated crops was observed in the studied two-year and three-year crop rotations implemented in Sharq El-Owainat region, where the yield of the cultivated crops was increased in the last year of the rotation, compared the first year. 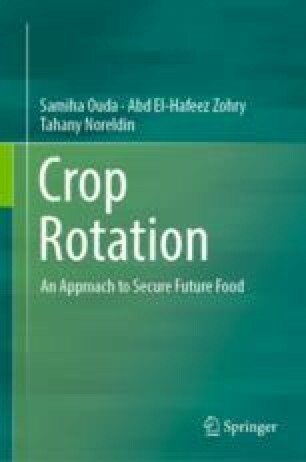 Furthermore, the suggested crop rotation could be implemented in the marginal lands of Egypt to increase the yield of forage crops and reduce its production-consumption gap.